Would your absence be noticed? I’D love to show you a photo of the first ever tomato to make it to full redness at the allotment, but Baby Bonnie picked it and took a bite before I got to her. Rather disconcertingly, she then spat it out and handed it to me. And she LOVES tomatoes. A little worried, I tried it, and couldn’t find anything wrong. Perhaps it tasted too much of tomato. There are loads more just changing colour on my solitary bush tomato, and it just proves that despite previously killing toms at the allotment, they can actually grow there, with even having to be netted. Apart from the tomatoes, It was lovely to visit the allotment last week, because on my previous visit I was concerned the season was over for me, bar the shouting. Suddenly everything is ready to eat, despite what certainly feels like the driest summer in years. A gap of three days since my last potter and the courgettes have turned from tiny half-finger-long veg-lets into marrows. Lots of them. The kids were digging carrots that were the longest we’ve ever managed in our solid clay soil. Yet more beetroot, spring onions, potatoes, raspberries, far too many beans (they still came through) and onions. The sweetcorn is coming along nicely, and I have a pumpkin plant starting to fruit. At home, there are more tomatoes and the first of a promising-looking mini-cucumber crop. Now the problem is keeping it going when we go away on our holidays. My attendance is somewhat random at the best of times. How will the plot, and home garden, survive? In recent years it hasn’t been a problem: it rains. Usually the problem is coming home to find the weeds have taken over. This year, we desperately NEED rain. And this is coming from someone who is going camping! What I’d really like is for it to rain heavily every night, just over Northampton, while we’re away. But more realistically, I’ll water and water as much as possible and cover the planting holes of the courgettes and tomatoes with muck and straw to try and hold in moisture while we’re away. Alternatively, you may be able to persuade a friend or relative to water every other day, or fit a drip irrigation scheme with a timer on the tap. I’m too disorganised to have done either. 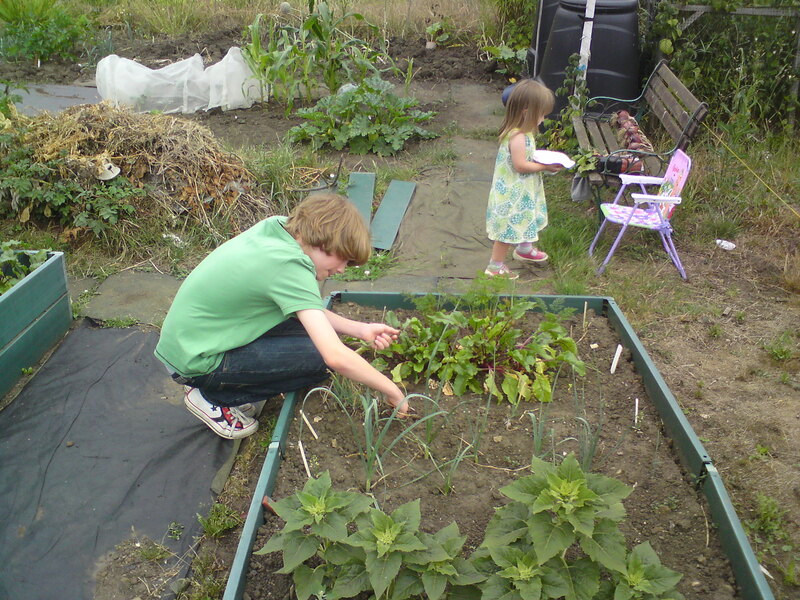 It was also a pleasure to visit the allotment with all the kids. Our eldest doesn’t have to come after school by virtue of being on the other side of town. It was nice to see how chuffed he was to find the seeds he’d sown in a raised bed back in May had turned into carrots, beetroot, spring onions, coriander and dwarf sunflowers. He’s also a good forager (scrumping is banned). He came back with blackberries, plums and gooseberries, all growing along the hedgerows (I made him show me). Foraging is a neglected art. There’s plenty of fruit growing along hedges, footpaths and on derelict land, as long as you’re sure you aren’t trespassing and you know what you’re picking!